We invite our customers to use these telephone numbers to call with suggestions, inquiries, or specific problems related to our products. Medtronic urges all physicians to return explanted products and to notify Medtronic when a product is no longer in use, regardless of reason for explant or removal from use. The procedures for returning products vary by geographic location. Mailer kits with prepaid US postage are available for use within the United States to send CRT, ICD, IPG, and leads to Medtronic’s CRHF Returned Product Analysis Lab. These mailers are sized to accommodate the devices and leads from a single patient or clinical event and are designed to meet US postal regulations for mailing biohazard materials. If the product being returned is located outside the United States, please contact your local Medtronic representative for instructions. Medtronic also requests the return of devices from non-clinical sources, such as funeral homes, and will assume responsibility for storage and disposal of the product once received. 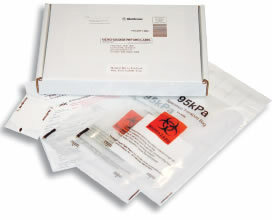 Mailer kits can be obtained by contacting the Returned Product Lab. For questions related to returning explanted product from outside the United States, please contact your local Medtronic Representative.